Concerned citizens can use this political complaint letter to address the mayor of a town. I am writing to you today as a concerned citizen of Anytown. It has come to my attention that you recently proposed a measure that would outlaw skateboarding on sidewalks in Anytown. 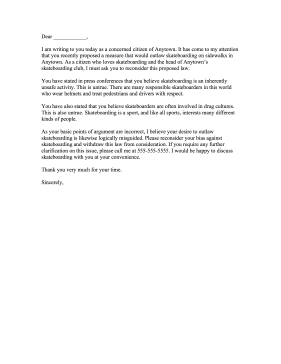 As a citizen who loves skateboarding and the head of AnytownÕs skateboarding club, I must ask you to reconsider this proposed law. You have stated in press conferences that you believe skateboarding is an inherently unsafe activity. This is untrue. There are many responsible skateboarders in this world who wear helmets and treat pedestrians and drivers with respect. You have also stated that you believe skateboarders are often involved in drug cultures. This is also untrue. Skateboarding is a sport, and like all sports, interests many different kinds of people. As your basic points of argument are incorrect, I believe your desire to outlaw skateboarding is likewise logically misguided. Please reconsider your bias against skateboarding and withdraw this law from consideration. If you require any further clarification on this issue, please call me at 555-555-5555. I would be happy to discuss skateboarding with you at your convenience.